have been enjoying living and working in the Peak District running this successful gallery for the past 22 years whilst raising a lively family of three alongside Russian Blue and Burmese cats, the most recent addition being Ralf, a Blue Burmese who is currently in training for customer relations. From the M1 at J29 follow directions to Chatsworth House until Baslow Village. 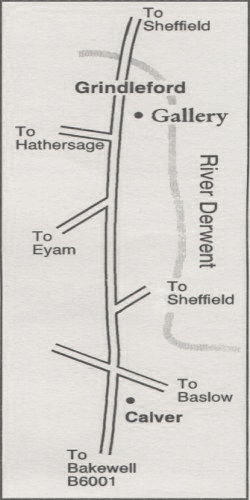 Go straight on to Calver Village and turn right at the crossroad B6001. After 2 miles the gallery is found in Grindleford on the right hand side of the road just before the bridge. There is one small step of 9cm up into the gallery and a ramp may be requested if required. Open plan layout suitable for wheelchair access. Please ask for a chair if you need to sit down. Nearest accessible toilets are at the recreation park 50m away. We enjoy meeting all our customers, many of them having traveled some distance to visit an exhibition whilst staying in the area. Everyone is welcome to visit the gallery and our opening hours are between 11am and 4pm Wednesday to Saturday and Sunday 1pm to 4pm, where you can view all the work for sale, previously seen on this site, and much more. There is usually plenty of on street parking outside and a safe playground nearby for children. We take all the usual credit cards and debit cards, cheques and cash. If you are not able to visit the gallery in person and you wish to purchase something you have seen on the site you can either telephone or email us here at the gallery with your request. All pictures, on the web site are priced in pounds sterling and are exclusive of postage and packaging. We will package your items appropriately and then contact you with the cost of delivery. 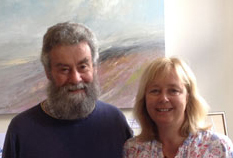 At the gallery we have enjoyed meeting people from all over the world as they travel and work in the UK and many have taken the opportunity of purchasing a painting from the gallery for their continued pleasure at home. We have arrangements in place for international shipments using a trusted packing and delivery company, where the package is too large to travel with the customer or when purchased away from the gallery. In our experience of handling sales over the Internet and by telephone we are able to provide further photographs of any painting to help when making your selection. Countries vary in their rules and regulations for exporting and we can provide you with a quote for the cost of packaging and delivery to your address wherever you live in the world.